The two recent late nights are catching up with me so I decided to set up the camera and make a timelapse of the summer milky transiting past the yew tree and nearby tree line. While the camera was clicking away, I got out my handheld binoculars and set up the sun lounger. I felt like a change from the big dob and what better what than to relax in comfort, looking up at the stars. I used the binos to find the enigmatic star R Corona Borealis. This unusual star dims from time to time as carbon builds up in its outer atmosphere. It is normally at or around mag 6 (faint star just visible to the naked eye) but then dims to mag 14 which needs a large telescope to see. I used the SPA and BAA VSS chart to locate R Cor Bor and it is clearly in a fade. I shall continue to monitor and look for it reappearing in the field of view. 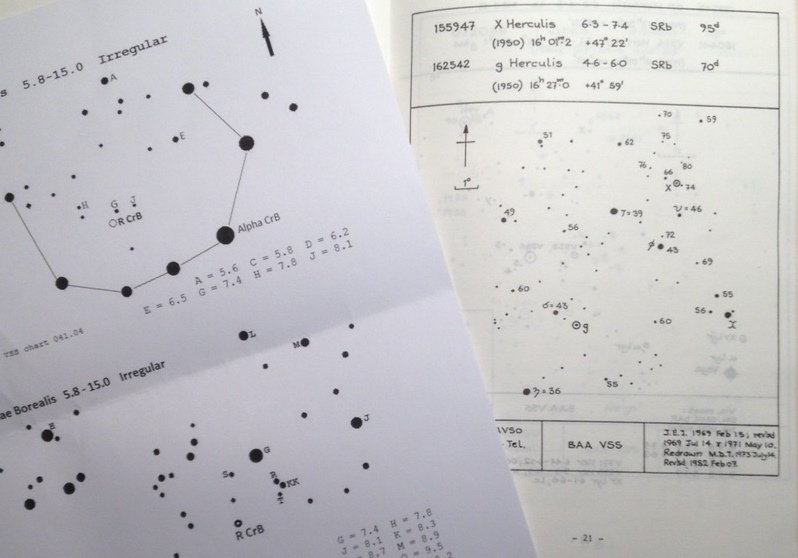 I compared it with the star chart and estimated it to be mag 9.5. I then star hopped to X Herculis again using the BAA VSS finder chart. This was quite a challenge to locate as there appears to be three stars of equal brightness where the chart shows there to be two. 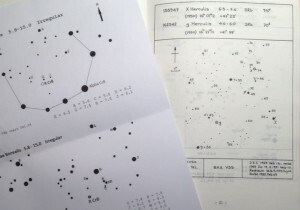 I assumed the northern-most star is the variable as shown on the chart although I will need to check this! Anyway, by comparing back and forth I estimated this to be approx. mag 8.7. I haven’t made a variable star measurement for some time so this was a real pleasure. I always enjoy binocular observing – especially with the sun lounger fully reclined and the milky way overhead! It was also nice taking 2 minutes to pack everything away – far quicker than the big dob! Anyway, while I had been measuring variable stars, the camera had been busy collecting photons. I looked at them the next day and, to my horror, the camera only detected the bright stars and not the Milky Way. It turned out I had the ISO still set at 100 following some daytime shots making 1.5 hours of timelapse photography pretty useless!